Where has grammar been hiding all these years? The UK’s conservative newspapers were thrilled last week when Michael Gove, the education minister, announced a crackdown on ‘incorrect’ English – leading the Daily Mail to rejoice that ‘Grammar is back!’. (Where has it been, one wonders?) In future, students will be penalised for ‘poor spelling, punctuation and grammar’. But who decides what is ‘correct’? In the case of spelling, this is fairly straightforward because spelling has (largely) been standardized. Punctuation is a little more tricky, but a change in punctuation can change the meaning of a sentence so it makes sense to learn how to use it effectively. But grammar is more problematical because, for many self-appointed arbiters of the language, ‘bad grammar’ is an all-purpose term which means little more than ‘anything I don’t approve of’. This can include ‘rules’ like: never use a split infinitive, don’t start a sentence with ‘and’ or end it with a preposition, don’t say ‘Can I …?’ when asking permission to do something, and don’t create verbs from nouns like task or impact. The trouble is that none of these has anything to do with good grammar. 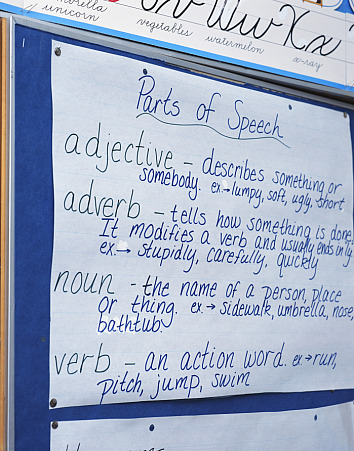 One of the stated aims of the Queen’s English Society is that people should have ‘a good command of English’, and no-one would disagree with that. But, they continue, this means being able to ‘communicate correctly/effectively in a competitive world’. What does this mean? Correctly and effectively, either correctly or effectively, or what? Their position is based on the popular idea that there has been ‘a decline in standards in the use of English over many years’, and this notion goes back at least to the time of Dr. Johnson. Back in the 1960s, the sociolinguist William Labov studied the language used by young African-Americans in New York City. What his work demonstrated was that this dialect was no less ‘rule-governed’ than standard American English. His research ran counter to the popular view that dialects like this were a sign of declining standards. On the contrary, Labov argued, this vibrant variety of English had its own distinctive grammatical and phonological features, but these formed a set of rules which were consistently applied. More recently, a similar panic has arisen over the use of texting and tweeting. One Comment on the article mentioned above suggests that ‘the influence of the new media technologies (such as texting, email and twittering) have made a deadly … contribution to the widespread dilapidated state of current English’. All the evidence points in exactly the opposite direction, as shown for example in David Crystal’s recent book about texting. Just like the dialect studied by Labov, texts and tweets have their own distinctive features, and these media (with their requirement for brevity) have spawned all sorts of clever, funny and inventive new uses of language. To me, this is a greater cause for rejoicing than the news that ‘grammar is back’. Some of the panic over the supposed degradation of English seems to stem from inter-generational incomprehension. Young people grew up with text-speak and soundly made it their own, leaving some of the old guard discomfited (and occasionally outraged) by its growing popularity. I’m generalising, of course; there are many enlightened exceptions, just as there are many young people who wouldn’t dream of sending a text without a ‘necessary’ full stop, and so on. There can also be a sort of mean-spirited one-upmanship in knee-jerk grammar gotchas: a way of catching someone out over something petty – something that, as you point out, might have little or nothing to do with grammar. Grammar is often conceived of as a set of unbreakable rules that you break at your peril; many of the best known are but pseudo-rules, stylistic preferences or arbitrary conventions to be imposed on the world at large. Spare us! I agree with Stan. Each and every generation bemoans both the grammar and sartorial stylings of the bunch of drainpipe/flare/Levi 501/low-batty-wearing ragamuffins that follows them. Grammar’s just a useful stick to beat the younger generation with (or “with which to beat the younger generation”, sorry). If grammar is just about “correct” or “incorrect”, it’s not a helpful tool. The article’s point about William Labov and his work on non-standard varieties is a good area where grammar can actually be a really useful thing to explore, as are texting and slang. If we look at the grammar of these forms and compare them to standard English, thinking about why they’re different (and often why they’re actually very similar) we can learn a lot about both the standard and the non-standard, and – to some extent – the different generations themselves. The King James Bible is one of our great works of literature, a fine exemplar, is it not? Download a text copy from Project Gutenberg, load it into a word processor and do a search-and-replace of ” with.” with ” with.” This will give you a count of the number of verses (sentences!) in the KJV Bible which end with that preposition. I leave it to some more ingenious person to devise an automated search for split infinitives. Oh look, Project Gutenberg has the complete works of Shakespeare as well . . .
Store the counts for the next time that some empty-headed parrot, replete with rote-learned rules impinges on your space! Thanks for your suggestion, Peter: an excellent idea. It’s well known (at least among people who make an effort to understand how language really works) that almost all the supposedly degenerate usages which the purists get so upset about can be found in the great works of English literature. and this produces a ‘concordance’ consisting mainly (about 90%) of split infinitives. In the British National Corpus (of 100 million words) there are about 2500 instances of these, but I haven’t had time yet to look at the sources. As you would expect, some are a bit clunky and would have been better avoided, others read well (and any effort to avoid a split infinitive would have made them worse). So the ‘rule’ is completely irrelevant. How very timely the article on “Where Has Grammar Been Hiding all These Years” was. As a literacy instructor teaching mostly EAL students I am noticing the changing face of literacy as defined by academia. Many of my students are very well versed with today’s modern technology and use it within their own cultural and community groups. Multi-literacies must start to be recognized as a valid and legitimate form of language evolution. Thank you, Ron. I expect code-switching has been going on since Neolithic times at least, but you’re right that new technology has quickened the pace at which new codes emerge. I like the idea of ‘multi-literacies’ – perhaps you would like to submit this as an entry to the Open Dictionary – we could do with it! It’s lost its apostrophe! ‘It’s’ or ‘Its’? Real Grammar Quiz, Question 1: Who or Whom?